I’ve put together a collection of things that I love, covert or aspire to own. Product links will take you directly through to the retailer’s online store for which I may receive a small commission. I have always loved Nigel Slater’s evocative and meandering food writing, but The Christmas Chronicles is now a firm favourite. Half-diary, half-recipe book, he potters domestically through November and December in preparation for the festive season. Throughout, he gently but continually reminds us of the enormous emotional and social value of food; its ability to nourish, spread joy and create connection. This book would be the perfect gift for foodies and avid readers alike, but my recommendation would also be to buy it as an early Christmas gift for yourself. Written in short chapters (ideal for busy/tired mamas! ), dotted with useful festive tips and delicious recipes (perhaps even more useful before Christmas arrives), and a thing of beauty in itself, this may just be the perfect pick-me-up you need during the long wintery evenings that lie ahead. My most recent book and the one I feel the most proud of. It offers a 10-day meal plan with vegan switches for each day so it accommodates everyone. But this book also offers my Positive Nutrition Pyramid which is a simple tick box system that helps us work out what we are or aren’t eating enough of and helps us to ensure that we are eating enough of the essential nutrients that we need each day in order to thrive. It also offers lots of guidance and tools to help address the most common issues that people face when trying to embark on a healthy lifestyle such as emotional eating, sabotage by ourselves or others and mindset. It really is my most comprehensive book yet and would make a lovely Christmas present for anyone who cares about nutrition or wants to make some healthy, sensible and practical changes to their diets. It is also available in an Audio version. This book has been published in the UK, US, Canada and Australia. A collection of my favourite recipes that many of my readers tell me have become staples in their homes, and which they return to time and time again. My first and still my most popular book even after all of these years. Currently discounted on Amazon. This book has been published in the United Kingdom, United States, Canada, Australia, Germany, France, Portugal, Holland, Japan, Czech republic and Albania. Winner of the Guild of Food Writers Cookery Book Award and OFM Best New Cook Book 2018 An essential addition to every cook’s bookshelf, The Modern Cook’s Year will show you how to make the most of seasonal produce, using simple, hugely inventive flavours and ingredients. Divided into six seasons, Anna Jones’s long-awaited new cook book contains over 250 delicious vegetarian recipes interspersed with tips on everything from seasonal music playlists to flowers to look out for in each month of the year. Guiding you through the year, from the coldest winter days to the long light summer evenings, The Modern Cook’s Year is set to become a contemporary classic. The Good Stuff shares over 100 family recipes and ideas for healthy and nourishing food that are yummy and easy to prepare. The book is focused on helping you and your kids develop a positive relationship with food and to help make family meal times a joy. It is packed with health tips and simple steps you can make to help your family become the best versions of themselves. It is fully referenced with some of the most up to date nutrition research in child health, and it teaches you why it is so important to feed your kids The Good Stuff most of the time. #BakeForSyria started by baker Lily Vanilli is the latest iteration of #CookForSyria the supper-club that became a global movement. This book follows the best-selling recipe book #CookForSyria which can also be purchased on Amazon. Traditional dessert recipes donated by Syrian families - passed down from generations. Syrian-inspired recipes lovingly donated by celebrity chefs, Great British Bake Off alumni and award winning cookbook authors. Stunning photography, artwork and design - all 100% donated. If you LOVE Middle Eastern cooking, this recipe book is perfect for you. 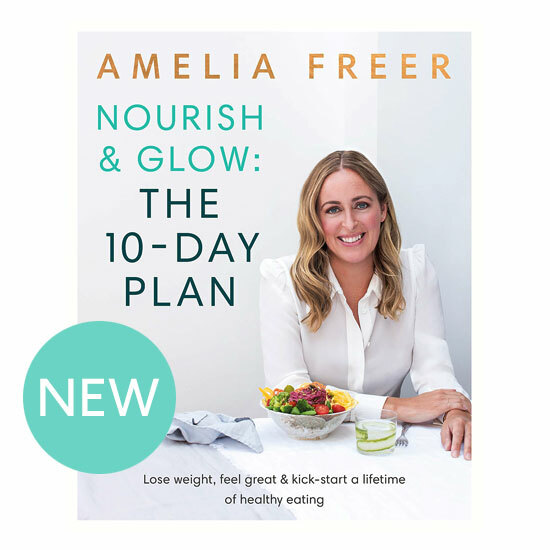 Contributors include: Anna Jones, Bill Granger, Dalia Dogmoch, Deliciously Ella, Edd Kimber, Dominique Ansel, Helen Goh, Imad Alarnab, Jamie Oliver, Jasmine Hemsley, Amelia Freer, Jordan Bourke, Lily Vanilli, Maggie Beer, Melissa Hemsley, Paul A Young, Rachel Khoo, Thomasina Miers, Yottam Ottolenghi ...and many more! Not for Profit... All profits from the sale of #CookForSyria the recipe book will be donated to charity - in aid of UNICEF's Children of Syria Appeal (Unicef UK registered charity). I have tried them all and in my opinion, this is the best spiralizer out there. Easy to clean and so quick, with three different settings, it makes salads way more interesting. There are lots of recipes for spiralizer vegetables on my website. This is such a handy piece of kit to have for making deliciously nutritious stews, casseroles, soups and stocks to arrive home to. Minimal washing up and minimal time. A perfect gift for a busy cook. A really good quality mandoline will serve you very well - be it veg or fruit, this is as sharp and versatile as they come. This is simply my most used, most favourite pan (you'll notice it in many of my Instagram pics) and such a good investment as they last for years. I use this every day. They come in a wide range of lovely colours. Individually cast in sand moulds and hand crafted at the original French foundry since 1925, each piece of Le Creuset enamelled cast iron cookware is perfectly finished and unique. Just like many of the recipes we treasure, Le Creuset casseroles are passed down through the family like heirlooms prized for their exceptional quality and timeless style and protected by a Lifetime Guarantee. This is a life-long friend - I find I gravitate to it every time I pop the oven on. Superb quality, it just gets better and better with age. Capacity 4.9L, so suitable for 4-6 people. This medium 33cm roaster is the perfect size for family meals. Reducing the plastic in our homes is a positive thing for so many reasons. I use these storage jars for all of the grains, pulses, flours, nuts and seeds which keeps them fresh and helps me to see what I have and what I need to re-stock. Mix and match them for a beautiful Instagram worthy shelf! Superior knives are an essential 'ingredient' in any kitchen tool-kit. Once you have a set like this, you'll never look back. GLOBAL knives are manufactured by Yoshikin in Niigata, Japan - first designed in 1985 by Komin Yamada who was commissioned to develop a range of knives that was truly new and revolutionary, using the best materials available and the latest manufacturing techniques. He was to fashion a series of kitchen knives which would appeal to the professional and amateur chef alike, be comfortable and easy to handle, and meet their most demanding requirements. These beautifully crafted boards are made by Temper Studio; a favourite of mine, run by George Winks, a master craftsman. George epitomises everything I feel about food: simplicity, structure and quietness. He is passionate about local sourcing to maintain the local economy and maintaining value in our precious woodlands, without which many would be destroyed, taking their ecosystems with them. As such, he only uses timber that is sustainably grown in the UK. These serving boards have been skilfully hand-crafted by one of the Temper team in their Wiltshire workshop from sustainably sourced English Sycamore, Walnut or Oak. Hand-rubbed in Danish Oil and natural beeswax the light reflects and breaks beautifully over its faceted surfaces. Perfect for serving and displaying your culinary masterpieces. All items, when not in stock, are handmade to order, so please contact Temper directly. Hand-crafted by Temper Studio (temperstuido.com) - this is a uniquely beautifully crafted gift. Temper Studio, a favourite of mine, is run by George Winks, a master craftsman. George epitomises everything I feel about food: simplicity, structure and quietness. He is passionate about local sourcing to maintain the local economy and maintaining value in our precious woodlands, without which many would be destroyed, taking their ecosystems with them. As such, he only uses timber that is sustainably grown in the UK. The PLANE Carving Board is handmade from sustainable English Ash with brass spikes, juice channels and includes a small serving board which shields the spikes when the board is not in use. It is precisely hand shaped by one of the Temper team in their workshop in rural Wiltshire and finished with natural oils and waxes. The geometric faceted surfaces bring contemporary minimalism to your traditional Sunday Roasts. Each carving board is made to order so please contact Temper directly. Everything tastes better with a grating of lemon or lime zest or a pinch of nutmeg. I use this microplane every single day. Every kitchen needs one - it's a true kitchen tool. This is far easier than the table mounted ones. I use this for making marinades, sauces, cocktails and more! A good, natural bristled vegetable brush is a great tool for the kitchen (esp, if you grow your own). It has a stiff bristle end and a softer bristle end ensuring you always have the right stiffness of bristle for any given vegetable. Founded in 1935, Redecker utilises over 70 years of knowledge and experience in ecology, environmental protection and recycling to produce a large range of hand-made, quality products, in an environmentally friendly way. All materials are natural, conscientiously sourced, and traditionally hand crafted to produce high quality, aesthetically pleasing products at a lower cost to the environment. Exquisite handmade stoneware lunch plates with a white glazing from MM Forsberg. Forsberg 1935 is a lifestyle brand with unique handmade products from small producers in England, Italy and Norway, the three homes of our founder Marte Marie Forsberg. Every item in our shop designed by Marte Marie Forsberg and handmade by a small group of individuals that Marie has personal relationship with. I love to potter in the kitchen and there is something wonderful about dressing for the occasion. These natural linen aprons are a joy to wear and practical, too. They come in a variety of colours. Personally, I think there are few things in life better than a newly laid bed or table and linen has to be the ultimate in fabrics. These tablecloths (come in 3 colours) are made with heavyweight natural linen. Whether drinking a cool glass of wine or a delicious non-alcoholic cocktail, these glasses lend true elegance. Practical and stylish, these are a great gift for any cook. The measuring spoons are made of stainless steel which means our cups will never rust and can safely be placed in the dishwasher after use. Each spoon is engraved with the correct measure so they are durable and attractive looking, will never rub off and do the purpose they are intended for very well. If like me, you have a young budding eater in a high-chair, or you are prone to chopping herbs for every meal, you'll have the kitchen brush out regularly. This brilliant little table brush is perfect for those occasions. Time saver +++. For those that follow me on Instagram, you'll know that I love Bamboo Bamboo - not just for their delightfully styled children's accessories, but also for their ethos. The Baby Bamboo Bowl with Suction Base allows you to feed your child without exposure to BPA and other chemicals that leech into food from plastic bowls and plates. It is lightweight, stain-resistant and naturally antimicrobial. No harsh chemicals or dyes are used to produce them. Gentle on the environment, too. We all want to maintain a better planet for our children. Bamboo is one of the fastest-growing plants in the world, replenishing itself within a year after harvest. It requires minimal watering for optimal growth, and is completely biodegradable. For those that follow me on Instagram, you'll know that I love Bamboo Bamboo - not just for their delightfully styled children's accessories, but also for their ethos. The Baby Bamboo Plate with Suction Base allows you to feed your child without exposure to BPA and other chemicals that leech into food from plastic bowls and plates. It is lightweight, stain-resistant and naturally antimicrobial. No harsh chemicals or dyes are used to produce them. For those that follow me on Instagram, you'll know that I love Bamboo Bamboo - not just for their delightfully styled children's accessories, but also for their ethos. Bamboo and silicone allow you to feed your child without exposure to BPA and other chemicals that leech into food from plastic baby utensils. Their spoons are lightweight, stain-resistant and naturally antimicrobial. No harsh chemicals or dyes are used to produce them. No-one could have escaped the phenomenal success of S'well. I am also a fan! Whether hot or cold liquid, these triple insulated bottles are perfect for the job . . . and are super stylish. Choose from a rainbow of colours. Perfect 2-compartment hermetic lunch box and cutlery set. Beautifully designed, practical and durable, these boxes are ideal for packing healthy hot or cold lunches with style. For those who struggle to sleep, a little spritz of this can help to calm the mind and soothe the soul. Sleep is as important for our health as diet. Neom's Perfect Night's Sleep Pillow Mist is expertly blended to help you relax and prepare for sleep. English lavender, chamomile and patchouli plus 11 other essential oils. Fragrances are 100% natural fragrances. A modern and fresh take on Rose, this blend is part of Neom Organics London's Scent to Calm & Relax range. Each candle contains pure essential oils which have the power to positively change your mood. Even its name is dreamy. Does a better stocking filler exist? Midwinter crystal candle by The Owl & The Apothecary Midwinter Crystal Candle has been created to bring you warmth, balance, and all things good. The therapeutic powers of Orange & Cinnamon essential oils will help you reflect & reset and the high vibrations of Quartz will help you manifest your intentions like never before. A luxurious Crystal Candle hand-blended and poured in Dorset with a high vibe quartz suspended in the wax - a super cosy Christmas absolutely guaranteed! This cleanser feels like such a luxury and really leaves my skins soft. And it smells wonderful! Hands down the best mask that I have used to help restore my tired and dull skin. This is glow in a jar! My favourite natural foundation. A little goes a long way so this lasts for ages. Simply my favourite face oil. I love all of Trilogy’s range but this oil has become my staple face oil. Certified organic, 100% natural. Clinically proven to help scars, stretch marks and wrinkles. The prettiest pale pink for special occasions. Being in the kitchen and garden most days, I wash my hands more than most. This is another brand that I love for its purely natural ingredients. There are no nasty chemicals or artificial colours and nothing is tested on animals. And they smell absolutely delicious - truly - aligned with the evocative aroma of my garden on a summer's eve. Perfect to soak in before bedtime to soothe aching muscles and encourage deep relaxation. These salts are a safe way to increase the body's level of both Magnesium and Sulphate. I am a convert - a true subscriber to home deliveries - be that a box of vibrant organic, seasonal food or a regular supermarket delivery. Planning, of course, is key to eating well. Riverfood is a well established company that delivers throughout the UK. With recipe cards included, this would make a uniquely thoughtful gift for busy families or friends. Delicious and makes a perfect non-alcoholic cocktail – great for the party season or for dry January! Head to seedlipdrinks.com for seasonal cocktail inspiration. I have an organic coffee most mornings to kick start my day. Cru Kafe use the best organic coffee beans the world has to offer. No pesticide, no aggressive farming (their beans are certified organic by the Soil Association and they only work with Fairtrade farms and cooperatives which put profits back into their communities). For the first time ever, all their packaging - including our new aluminium pod and our boxes - is completely recyclable. Rich in a wide variety of minerals. The distinctive rose pink colour is a result of the high mineral content in the salt (iron, potassium and magnesium) all vital for good health. Every kitchen deserves a really good selection of lovely spices and herbs – this set makes a superb gift and are my favourite offerings. A delicious soy free seasoning – great for tahini dressings or stir-fries. Because every kitchen needs an excellent all-round olive oil to drizzle over roasted vegetables, salads and for dressings. Greek PDO Extra Virgin Olive Oil produced from Koroneiki olives grown in the Kalamata region of southern Greece. Distinct grassy-green in colour, with a robust herbaceous flavour which builds in the mouth to leave a pleasant peppery aftertaste. Ideal for salad dressings, grilled fish, white meat, sauces and vegetables.